Cinemablographer: SAG Awards Tonight: The Race's Decisive Moment? The Oscar race is shaping up to be a contest between actioner powerhouses Mad Max and The Revenant on one side and timely, talky ensemble films Spotlight and The Big Short on the other. I think that Mad Max has the heat, but the actors' guild didn't give it any love outside the stunt category... and they could have if one considers that it has a much stronger, tougher, and meatier cast than, say, Beasts of No Nation. 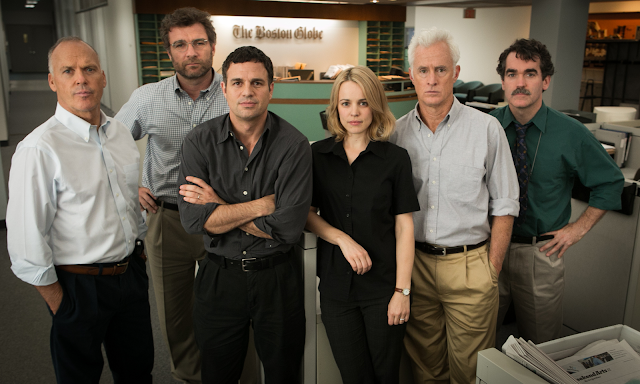 The Big Short, meanwhile, has some momentum behind it with recent wins at the Producers Guild and American Cinema Editors guild, so Spotlight needs to win with the actors to reassert the loose lead it's been holding against Mad Max. I think it will given the range of talent and skill that riff off one another as a team. This year's SAG awards have surprisingly low overlap with the Oscar nominees (only 13 out of 20 nominees) with Oscar contenders like Sylvester Stallone, Jennifer Lawrence, Jennifer Jason Leigh, and Mark Ruffalo absent from the list. However, the differences between the SAG and Oscar nominations ultimately show what a competitive year it was--and, more significantly, I think, these nominations display heavy influence of campaigning from the teams behind Beasts of No Nation, Trumbo, I Smile Back, and, yes, Straight Outta Compton. It's not to say that Straight Outta Compton doesn't deserve a nomination for Outstanding Cast, but I think this nomination shows that some of the criticism targeted against the Academy is unfair: the cast of young actors is great as whole, but there's no real standout in this team of unknown actors. They work best as a group and they're fairly acknowledged as such. Hey, they could even win given on merit. Wouldn't that be a mic drop for the race? Which actors do you think will win/should win?